Amsterdam, the Netherlands, 24 August, 2017 – Today, the Access to Medicine Foundation publishes the methodology for its 2018 Antimicrobial Resistance Benchmark. It is the first independently developed framework for evaluating how pharmaceutical companies are taking action to limit antimicrobial resistance (AMR). The framework was developed through consultation with stakeholders and experts working in AMR to build consensus on the priorities for pharmaceutical companies in AMR. In the coming months, the Foundation will use this framework to map pharmaceutical companies’ antimicrobial R&D activities, their strategies for responsible manufacturing and production, and their antimicrobial stewardship and access plans. Thirty companies are in scope, representing a cross-section of the pharmaceutical industry, including multinational research-based pharmaceutical companies, generic medicine manufacturers and clinical-stage biopharmaceutical companies with antimicrobial pipelines. The results will be published in the Antimicrobial Resistance Benchmark Report in early 2018, funded by UK AID and the Dutch Ministry of Health, Welfare and Sport. Antimicrobial resistance (AMR) happens when a medicine is no longer effective against a virus, bacterium or other pathogen. In recent decades, AMR has become widespread globally. Without effective antimicrobials, particularly antibiotics, infections will become more difficult to treat. Medical and surgical procedures in hospitals could also become less safe, with an increased risk of prolonged sickness, disability and death. The emergence of AMR is accelerated by the misuse and overuse of antimicrobials. Efforts to curb it must include plans to ensure these medicines are used appropriately and only when needed. At the same time, millions of people, particularly in poor countries, do not have access to the antimicrobial medicines they need. Both issues must be tackled together in order to curb AMR. The past year has seen a surge of commitments to addressing AMR, including from governments, public health authorities, international health organisations, and academic institutions. AMR has topped the agendas at G7 and G20 Summits, the World Health Assembly and World Economic Forum. Numerous pharmaceutical companies have publicly pledged to take action, signing the Davos Declaration by the Pharmaceutical, Biotechnology and Diagnostics Industries on Combating Antimicrobial Resistance, followed by the Industry Roadmap for Progress on Combating AMR. 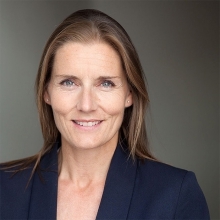 The Foundation has developed the Antimicrobial Resistance Benchmark to identify and publicly recognise those companies that are taking the right actions and to enable their peers to adopt innovative approaches and good practices. It will also uncover hurdles to deeper company engagement in global efforts to limit AMR. To develop the Benchmark’s methodology, the Foundation’s research team consulted with a wide range of stakeholders and experts working in AMR, including from the UK and Dutch governments, World Health Organization, Center for Disease Dynamics, Economics & Policy, Chatham House, Pew Charitable Trusts, the Review on AMR, the AMR Industry Alliance, the Combating Antibiotic Resistant Bacteria Accelerator (CARB-X), the DRIVE-AB project, the German Union for Antibiotics Research and Development, the Global Antibiotic Research and Development Partnership, as well as pharmaceutical companies and investors. Strategic guidance was provided by an Expert Committee of specialists in AMR. The resulting methodology will be used to evaluate pharma companies in three areas: Research & Development; Manufacturing & Production; and Appropriate Access & Stewardship. As AMR grows, existing medicines become obsolete. New and improved medicines and vaccines are critically needed, particularly new antibiotics that target resistant pathogens. 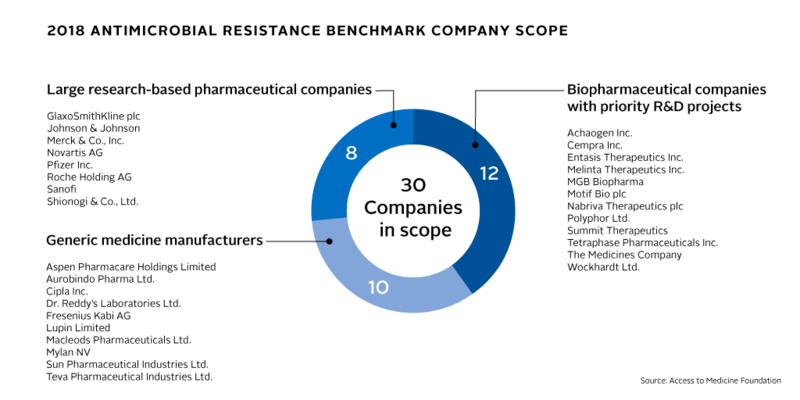 The Benchmark will map companies’ antimicrobial R&D and highlight efforts to target pathogens whose distribution and drug resistance makes them a priority target for R&D. Pharmaceutical manufacturing and production processes can contribute to antimicrobial resistance through two key routes: by releasing antibiotics into the environment in wastewaters; and by manufacturing antibiotics with insufficient levels of the active antibiotic ingredient. The Benchmark will compare company strategies for limiting these two routes to resistance. The twin challenges of improving access to antimicrobials while also ensuring their appropriate use (i.e., stewardship) must be tackled in tandem. The Benchmark will assess companies’ antimicrobial access strategies for low- and middle-income countries alongside their global stewardship initiatives for antibiotics. The Foundation is currently gathering data from public sources and directly from the companies in scope. This data will go through clarification and verification rounds, before being scored, compared and analyse across 15 indicators. The resulting research and findings will be published in the Antimicrobial Resistance Benchmark Report early in 2018. The Access to Medicine Foundation is an independent non-profit organisation based in the Netherlands. Its mission is to stimulate and guide pharmaceutical companies to do more for people without access to medicine. It has published the Access to Medicine Index every two years since 2008; it ranks 20 of the world’s largest research-based pharmaceutical companies on their efforts to improve access to medicine for the world’s poorest people. In 2017, it published the first Access to Vaccines Index. The Benchmark is funded by UK AID and the Dutch Ministry of Health.